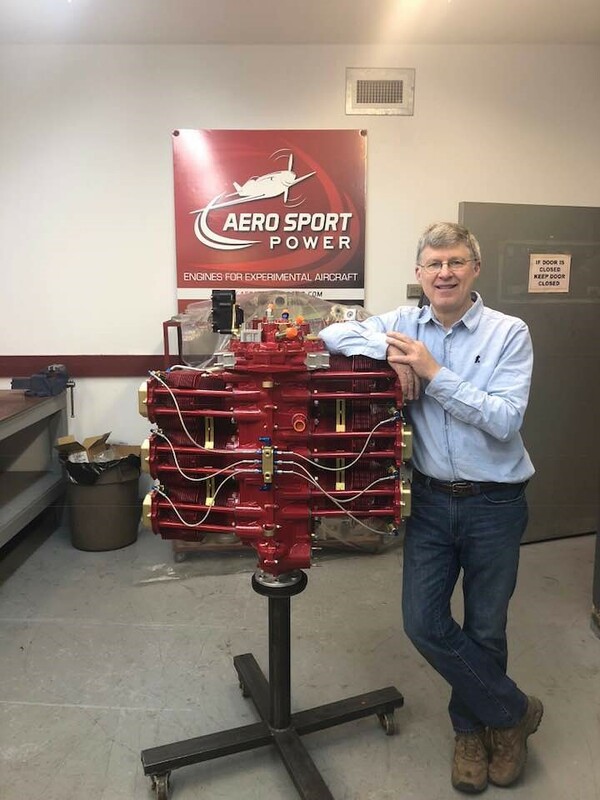 After a lot of thought I decided to order a *new* engine built from a Lycoming IO-540 kit by Aerosport Power located in Kamloops British Columbia Canada. As a Lycoming distributor they still have access to these kits. I originally planned to get another engine from Barret Precision Engines (Tulsa Ok) which is where I got my first engine. They are great people BTW. I went with Aerosport as the thought of a *new* engine was just too attractive. An option that Aerosport provides is a "builder school" . Here you work one on one with one of their techs and assemble an engine from a large pile o' parts. When I inquired about the school they said you can do as much (or little) as you wanted. I went to "school" on Monday am and was able to assemble 95% of the engine with the expert guidance of one of their techs (Simon). The crank was bolted to an engine stand and the con rods were installed. By lunch we had installed the bearings, crank & cam in the case, installed lifters, nose seal and mated the case. I was amazed at how tight the case through bolts were (necessary to prevent fretting). I large hammer (maul?) was used to drive them into place. The assembled case was reattached to the engine stand. Then, after lunch the jugs were installed. This was a complete non event. Lots of LubriPlate and the correct tool to compress the rings and they simply slid into place. Push rod tubes were installed along with the accessory case and cold air induction air box. The next day he engine was completed. This included the push rods / rockers / injectors / fuel block / induction tubes etc. Day three involved installing the engine on a test stand. This was fairly complex as I am using the SDS EFI/EI. There was a ton of wiring to install but it all went quite smoothly. At the end of the day the first two engine ruins were performed. The engine started quickly. I expected a cloud of black smoke based on all the assembly lubricant used but I only got a small initial puff of white smoke. The engine started in 2 or three seconds was smooth and strong. On the morning of day 4 the final two engine runs were performed. After that the engine was removed from the test truck and prepped for palletization. This included installing by accessories (Denso alternator / 90 degree oil adapter / backup alternator etc). The engine was put on a pallet and then crated. Today I drove home with the engine. There were a few gotchas that Aerosport handled with ease. 1. I was using Barret's Cold Air Induction system on the engine (Barret was quite happy to sell it to me without an attached engine!). At the end of day 1, when torqueing one of the studs, it started to pull out. I spoke to another of the techs (Rob) who said no problem. I pulled the box and he installed a helicoil and that was that. 2. The Barret CAI system was new to Aerosport. They didn't realize that the induction tubes needed welding to the flange adapters. No problem - they had a local welder come in the next day and he did a very nice job. 3. The CAI system required induction tube flanges with deeper recesses than the flanges that came with the engine kit. Darryl found the required flanges and had them painted in very short order. What I really liked is that everyone involved in my engine (even peripherally) were very approachable. For example, the chap (Stephen) who painted my engine and flywheel asked if I really wanted to leave my CAI system in green (I said I did). He then pointed out that the green was zinc chromium and was not really *paint*. Based on his recommendation I asked him to paint it – I was in Ferrari red by the next day. He could have easily just shrugged and walked away but he made sure I knew the implications of what I asked for. I really appreciated that. I more or less had the run of the shop and was free to chat with everyone there. At no time did I feel limited. All my questions were answered and at no time did I feel rushed. As I was hands on all through the process I really learned a lot about the engine and how it operates. Based on the course, I would have no problem swapping a jug (provided I had the right tools). I would also like to give a shout out to B&C. I had purchased a standby alternator that I planned to install at Aerosport. During the install it became apparent something was amiss. I spoke to TJ at B&C who con firmed there was a problem with the alternator supplied. Less than 24 hours later FedEx had delivered a replacement. Things can and will go sideways at times. A measure of a company is how they deal with these situations. B&C could not have been better. Another shout out should go to Ross and Barry at SDSEFI. Their Electronic Fuel Injection and Electronic Ignition system is a work of art and performed flawlessly. I look forward to flying behind it. To close on the school, the only things I did not do was install the nose seal, silk thread the case halves and adjust the push rod lengths. Each of these operations I wanted to be done by the most expert of hands. I did pretty much everything else. During this, Simon was great at gently pointing out my mistakes so I could correct them. In short, the build school was well worth the price of admission. The Aerosport people were all very pleasant, approachable and knowledgeable. Pix of my Aerosport go fast engine is attached! Well done Les. Thanks for the info. I also have noted that the Aerosprt Power people have always been super.... questions, problems etc. So les, exactly how much HP does this beast produce?� What mods did they make to get it to produce that HP. Still as fun as it was on the first flight. What I really liked is that everyone involved in my engine (even peripherally) were very approachable. For example, the chap (Stephen) who painted my engine and flywheel asked if I really wanted to leave my CAI system in green (I said I did). He then pointed out that the green was zinc chromium and was not really *paint*. Based on his recommendation I asked him to paint it â€“ I was in Ferrari red by the next day. He could have easily just shrugged and walked away but he made sure I knew the implications of what I asked for. I really appreciated that. I� more or less had the run of the shop and was free to chat with everyone there. At no time did I feel limited. All my questions were answered and at no time did I feel rushed. As I was hands on all through the process I really learned a lot about the engine and how it operates. Based on the course, I would have no problem swapping a jug (provided I had the right tools). I agree on the injector lines. All of that will happen when the engine is installed. I want to change a couple of the lengths so things are a bit neater. My flying -10 has the same engine (9:1 pistons & cold air induction). It dyn o'd out at 287 HP. Ross's customers report an 10-12 HP boost with EFI/EI. That brings me up to about 300 HP. That is what is on the data plate. or 94UL gas. Don't know what octane 9:1 takes. I tend to doubt that EI or EFI add significant amount to full power. explained by compression and cold air induction. to use the JATO bottles I installed for looks and pilot miscalculations. AD 2015-19-07. Clearly something to pay attention to, regardless of where you sit on the E-amateur built vs AD compliance debate. The service bulletin shows you exactly where Lycoming thinks the clamps should be. My understanding is that 9:1 is probably good. Any more than that might have some issues. We will wait and see. I went 9:1 thinking that I was fine for the short term and that, by the time a replacement fuel became widely available, I’d be close to ready for a top overhaul anyway. And at that point I could go back to 8.5’s if it looked like that would be necessary. At the rate I’m flying this thing, that might come soon. I’m stacking the hours on her. It’s too much fun and too useful. But even 120 hrs in 10 months isn’t nearly enough time in at the controls. I still need more. Just curious if folks with higher than stock 8.5:1 compression have a plan IF 100LL goes away and its replacement doesn't prove to have as much octane. We know the stock compression will run on 91 octane mogas or 94UL gas. Don't know what octane 9:1 takes. I tend to doubt that EI or EFI add significant amount to full power. Their main benefit is what they do to improve power in cruise and high altitude conditions. Your take off power timing (and power output) will be exactly the same as it is with a dinosaur magneto... at 25 degrees BTDC. There maybe a hair bit better mixture distribution/control with EFI, but continuous flow manifold fuel injection has proven very good as long as intake runners are of equal length, which is mostly true for Lycoming designs. Remember that stock power ratings have a tolerance of plus or minus 5%. Les's flying engine is a plus 10%, which is mostly explained by compression and cold air induction. > My flying -10 has the same engine (9:1 pistons & cold air induction). It dyn o'd out at 287 HP. Ross's customers report an 10-12 HP boost with EFI/EI. That brings me up to about 300 HP. > That is what is on the data plate. grade and make it in the market to hopefully control pricing. > Just curious if folks with higher than stock 8.5:1 compression have a plan IF 100LL goes away and its replacement doesn't prove to have as much octane. We know the stock compression will run on 91 octane mogas or 94UL gas. Don't know what octane 9:1 takes. > I tend to doubt that EI or EFI add significant amount to full power. Their main benefit is what they do to improve power in cruise and high altitude conditions. Your take off power timing (and power output) will be exactly the same as it is with a dinosaur magneto... at 25 degrees BTDC. There maybe a hair bit better mixture distribution/control with EFI, but continuous flow manifold fuel injection has proven very good as long as intake runners are of equal length, which is mostly true for Lycoming designs. Remember that stock power ratings have a tolerance of plus or minus 5%. Les's flying engine is a plus 10%, which is mostly explained by compression and cold air induction. >> My flying -10 has the same engine (9:1 pistons & cold air induction). It dyn o'd out at 287 HP. Ross's customers report an 10-12 HP boost with EFI/EI. That brings me up to about 300 HP. >> That is what is on the data plate. What fuel flows are you typically getting Les, and do you run Lean of Peak? I don't run LOP as my injectors are not balanced for that. My fuel flow is about 12GPH or a little less. Get em balanced Les.... pretty easy.... after 1,000 at 2gph, that's an extra 2,000 gallons at $4, gee, that's $8,000. To say nothing of your engine actually burning ALL the fuel, thus creating less carbon buildup on valves, pistons, and rings, plus the oil stays cleaner. Maybe even more important is keeping each cylinder further away from running at the highest ICP (internal combustion pressure). I don’t normally run LOP either. Fuel is cheaper than metal! I run LOP because air is cheaper than fuel. I have seen many engines that were balanced well enough with stock injectors to run comfortably lean of peak. > I don't run LOP as my injectors are not balanced for that. My fuel flow is about 12GPH or a little less. all that nice stuff and what price wa the course? doing the engine any favors running it ROP to cover up the problem. haven't pursued trying to get my injectors better balanced. > I don’t normally run LOP either. Fuel is cheaper than metal! A little off topic but Don and Kelly are correct. Running LOP is much easier on the engine. CHTs typically drop 30 F when you lean, and that is probably the best measure of engine stress. Swapping injector orifices is easy. Balance the flow and run LOP. I typically burn 10 gph or less in cruise, depending on altitude. And air is cheaper than fuel.